Conn and I voted today. We were concerned when we got off the elevator and were greeted with the end of the line! The whole process took an hour, a small sacrifice for the chance to cast our vote. Well, voting's tough work so we had to refuel our depleted energy with a few of Dad's Donuts! We just can't get enough as evidenced in this pic from Dad's website. Heck, we're there so often that we were shot by the web designer a couple of months ago as she was photographing the shop for the website! So now there is hard proof of our confection addiction. Thanks to Marion the designer for giving us the heads up that we are on the site! Yesterday I made yet ANOTHER dessert. This time I made a Passion Fruit (Lilikoi) Cheesecake with a Pineapple Custard Filling and Coconut Shortbread crust. I still have not recovered from this combo of tart and tangy goodness. This time I made cheesecake bars instead of a pie. 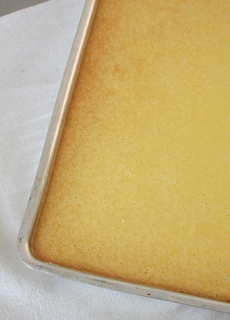 This recipe filled a "brownie pan" that measured 10 1/2" x 15 1/2" x 1" perfectly. But it can be made in any baking dish, cake or pie pan. 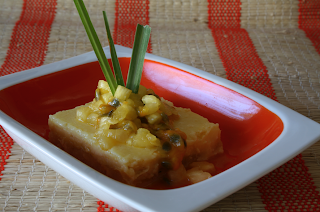 Topped with passion fruit/pineapple sauce and lemongrass garnish. Here is the recipe I used, which was adapted from the one I made a few weeks back with Lime. I did make a few changes in the prep as well. I felt that the custard needed to set up a bit before pouring the cheese mixture on top. Preheat oven to 350°F. Mix all crust ingredients to blend in medium bowl. 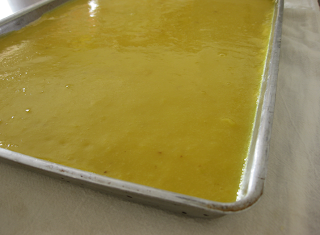 Press mixture evenly onto bottom of a pie pan or baking dish. 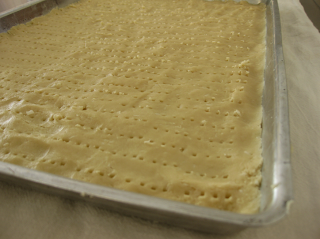 Pierce dough with a fork to allow air to escape. Bake until just set, about 10 minutes. Cool completely. Maintain oven temperature. 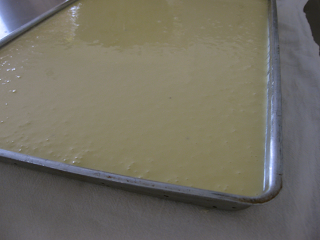 Pour custard mixture into crust & smooth top. Let set about 10 minutes until firm. Place cream cheese in a bowl and cream before adding other ingredients. Then add 3/4 cup sugar, eggs & passion fruit juice in bowl and mix well until creamy. Make sure your cream cheese is completely softened so that you will not end up with chunks in your mixture. Carefully pour cheese filling over the custard. Place foil on rack under cheesecake to catch any overflow as the cake dies rise a bit. Bake until set and center moves slightly when pan is gently shaken, about 45 minutes. Toothpick should come out clean when pierced. Cool then place in fridge. Serve chilled and garnish with passion fruit pulp and pineapple topping. The passion fruit seeds add a nice crunch and a bit of contrast in color. 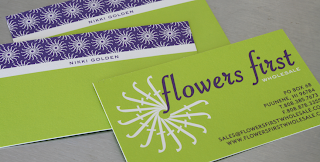 Here is a new logo and business card I created for Nikki and Justin at Flowers First here on Maui. The guidelines were to somehow use green, purple, circles and maybe orange. Hard to believe I did not get orange in there somewhere. I really wanted to play with the letter "f" somehow since there were 2 of them in the company name. 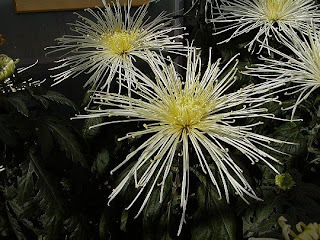 The result was this fuji or spider mum made out of radiating "f's". The back of the cards were inspired by japanese oragami paper and an obi sash. Please check out their temporary website I did for them at Flowers First Wholesale. We hope to have a few more pages up soon. By the way, Nikki and Justin were the ones that informed us that Kekoa was in "foster care". Mahalo. Occasionally Kekoa likes to play a little catch me catch me if you can. 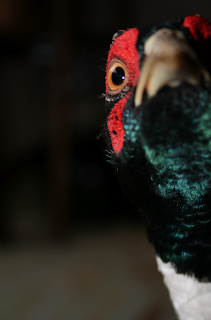 He starts to flit about and flap his wings, crouch and make low clucking sounds. He always instigates the game , and I willingly join in... chasing him about the yard which he seems to enjoy. Here are few pics and a short clip (color is not close to correct) of us playing around in the yard. 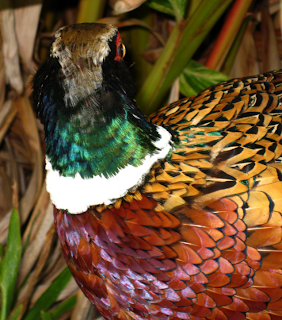 And as of today... those long beautiful tail feathers... GONE. What the? He seems to have lost about 4-5 since this morning. I suspect foul play. Someone's been swimming in my water. It brings new life to the phrase "Animal crackers in my soup". Here are some pics from my trip home to see family. I was especially glad to spend time with my dear friend Chrystine and her 15 month old, Stephen. What an adorable, smart and funny child. He was just picking up words left and right. Such a sweet boy. That is until later that night, when his first molar decided to show up! I guess it's painful to have a giant tooth breaking up though your gums as illustrated by his blood-curdling screams! Needless to say, Chrystine, my mom and I didn't get much sleep because we would immediately run in to help out. Chrystine felt so bad for waking up the house, he had been a very easy sleeper up to that point. But mom relished the opportunity to spend even more time with him and frankly so did I. We commanded Chrystine get some sleep before her long drive back down to NJ later that morning while we stayed up with the cranky baby boy. We let him run around and explore every nook and cranny of the house and just generally made silly fools of ourselves. It reminded me of the summers I was home from college when my nephew was that age. Trying to get that child to take a nap was quite the endeavor. We were sound asleep this morning when at 7:00 John suddenly woke up and said "Oh My God!". I of course thought that we had slept until noon at that exclamation. To my surprise he then said, "He's Back!". Yes sir... there he was ... pecking away at the grains we had been leaving out for all the other birds. We headed outside to greet him and he was just as calm as could be. It was like he never left. After eating his fill of grain... and yes macadamia nuts, he hopped up on his chair for a nap and has now wandered off for the afternoon. He looks great and has grown several inches in height an length. 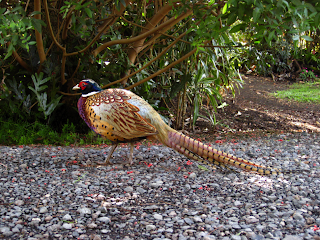 He has also put on a few lb's and his new plumage is rockin'! 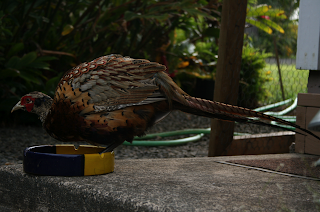 When we last saw him he had just a few white feathers around his neck. Now it's a full fledged ring. 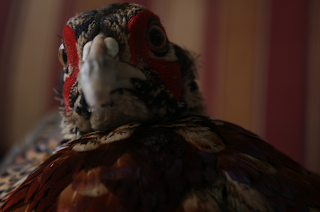 His beak looks a bit worn down, which we suspect might be a result of rubbing it on the wire of the coop he had been in. That happened when we had him in the coop as well. But it will heel in a few weeks. It looks like he was pretty well taken care of by his "foster parents". Now that we have a new camera with a video feature... we will get a vid up soon. Our friends Nikki & Justin who have met Keoka were talking with a friend of theirs who had recently moved somewhere down near us. 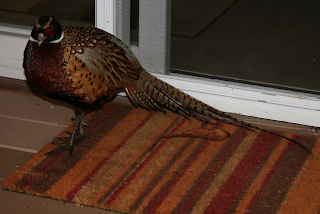 He said that there was this couple who had found a pretty tame pheasant a few weeks ago and they took him in. Nikki and Justin were not believing what they were hearing and told their friend about us and our adventures with Kekoa. They went to show him pictures here on CFC and they were doubly shocked when they saw the "Have You Seen This Bird?" post. So their friend took our info and was going to try and get the couple to call us for a return of sorts. Well 5 days have passed and we have heard nothing.... That is until now. Nikki just informed me that Kekoa was set free 2 days ago and their friend saw him out and about down the road. I tried putting a positive spin on things by saying that maybe they were meant to look after him while we were gone. Foster parents if you will. I hope that is true. And I can't imagine what he must look like now. We have missed out on his terrible teenage phase. In any case John and I are thrilled that he has been set free again... where he should be. It was great knowing that he was ok... but troubling knowing he was cooped up in a pen. 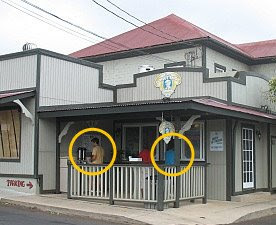 Come and see us soon Kekoa... we will have mac nuts waiting for you! Stay tuned right here on CFC for more adventures of Kekoa. This post might be odd coming from someone who delights in turning old record covers into other things. But I can't ignore a good design solution when I see one. Especially when it minimizes clutter and aids in the preservation of a near-extinct medium. And it helps that it involves a good friend too. 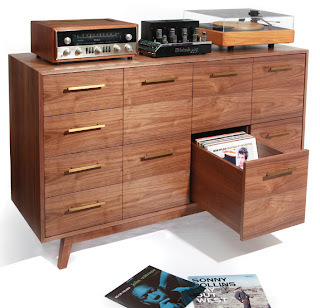 Enter, the Atocha Design Record Cabinet. Sleek and modern in design, warm and inviting in materials, it takes your old vinyl (and cd's too) off the shelves and stowed away for safe keeping. They were in the New York Times magazine a few weeks ago too. Hot stuff! We know it has been awhile since we gave you all an update on Kekoa. I wish we had something to tell you, but we don't. 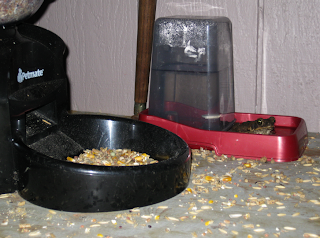 You see, just 2 days after we bought him a fancy auto-feeder he disappeared on September 15th. We saw him that morning and have not seen him since. That was one week before we went away. 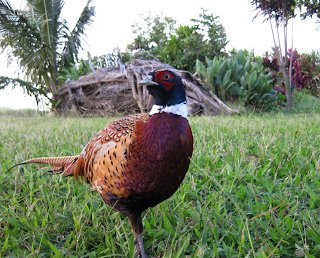 His days spent on the lanai were getting shorter and shorter, and the last few days he only came for breakfast around 7:00 AM and dinner around 4:30 PM. 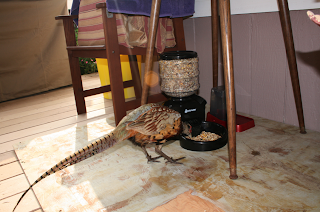 It is sad not having him around, but he is a wild bird and out on his own. 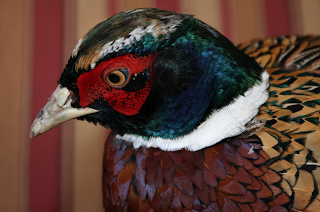 It was always our intention that he be returned to the wild to fly and roam freely. Who knows, he may show up again one day... maybe with a new family. If and when that happens, you will be the first to know. Below are a few pictures from the last visit. 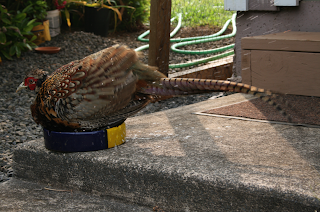 Taking a bath in his water dish. 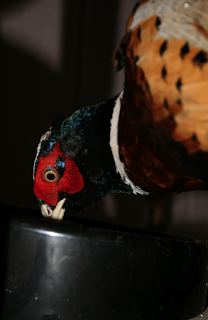 He seemed to like the new feeding system while it lasted. 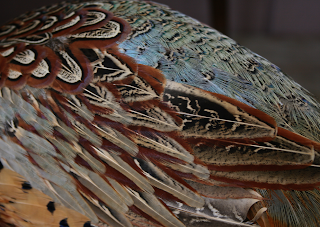 A detail of his amazing plumage. Still in Indiana and very much looking forward to heading back to Maui in a few days. Too cold here. I am sitting in a Starbucks so I can connect to the internet... DON'T ASK. 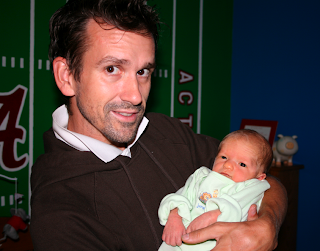 My cousin Jenny and her husband John welcomed a new baby last week. Here are a few picks of my new 2nd cousin Jack. So tiny at just around 7lbs. Very cute. 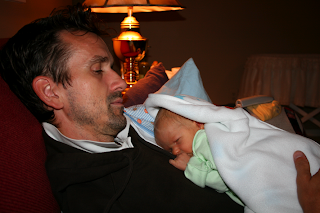 This is how I spent about an hour and a half last night.... with him sleeping on my chest. I think he will fit in my carry on.